A campaign is under way to make a north Wales mountain range a national park. 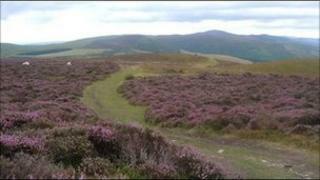 The Clwydian Range is celebrating 25 years since it was named an area of outstanding natural beauty (AONB). To coincide with the milestone anniversary, Clwyd West AM Darren Millar is calling for the hills to be given the special status. The decision lies with the Countryside Council for Wales (CCW), who said the range's AONB status means it already has the same level of protection. To award the status CCW would have to consult with every joint planning board and county council whohave a remit over the land within the park. If successful it would make the Clwydian range Wales' fourth national park joining Snowdonia, the Pembrokeshire Coast and Brecon Beacons. The "Clwyds" span 35km (22 miles) in length from the Vale of Clwyd in the west to the foothills of the Dee estuary to the east; from Prestatyn Hillside in the north to the Nant y Garth pass in the south. Its highest point is 554 metres (1817ft) at the summit of Moel Famau in the centre of the range. Mr Millar described the area as a "national treasure". He said: "There is no doubt in my mind that the Clwydian Range deserves to be designated as a national park. "With a unique landscape, biodiversity and archaeology, it is every bit as special as other places which enjoy national park status." Mr Millar believes the prestige that comes with the title would be hugely beneficial, providing a boost to the local economy and creating jobs. He said: "Communities and businesses associated with the Clwydian Range would benefit significantly if it were to be designated, especially in terms of opportunities to promote the area to locals and visitors. A spokesman for CCW said it continued to recognise the range's significance through grant aid and advice and its AONB status meant it had the same level of protection as a national park. He said: "During the 25 years since designation, the local authorities and CCW have worked in partnership to ensure the natural beauty of the Clwydian Range has been protected and managed effectively. "The AONB management service is also currently involved in raising the profile of the AONB through installation of roadside threshold signs and a particular effort is being made to promote the area during its anniversary year."